Each Box contains Two Young Guns Rookie Cards, on average! Grab the ever popular UD Canvas set including more Phenoms in the UD Canvas Young Guns insert. Grab Harder-to-Find UD Canvas Gems, including Retired Stars and Team Canada. Find an array of Rookie Chase Cards in this year's Series 2 release including Rookie Materials Jersey! 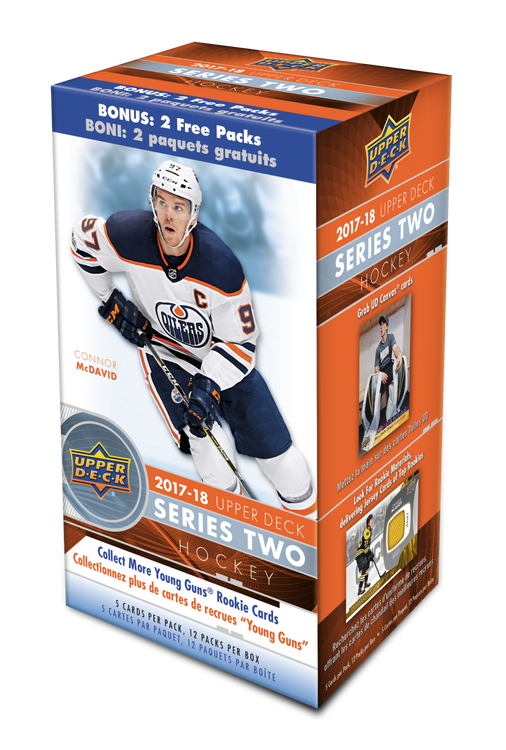 Pull O-Pee-Chee Update Rookie cards, including the popular Retro design! Complete Your 2017-18 Upper Deck Set, an Epic Collectible for any Generation. Collect the rest of the Day With The Cup cards, commemorating the 2017-18 Champs.